Outstanding testing strategy is the only way to make your mobile app ready for business. 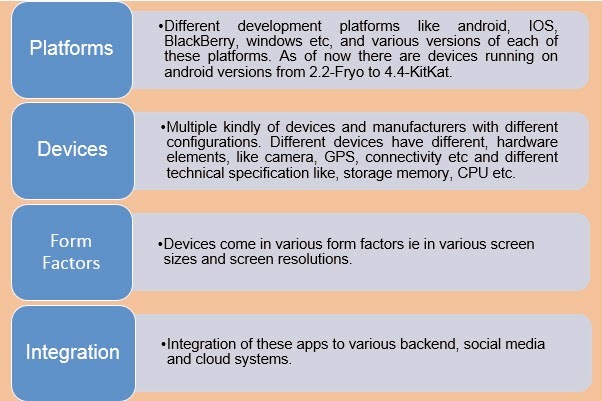 To add to complexity there are thousands of different devices each delivering multiple form factors. To ensure app performs to its best it, it’s a mammoth challenge for quality assurance team to test in all above scenarios and certify the product keeping in mind budget and time constraints, QA team need to have right strategy, tools and processes in place. While mobile applications are rapidly becoming core and critical part for profits for corporate software world, new and complicated challenges to the software delivery model are also taking centre stage. This set of challenges are exclusive to the mobile testing world. This blog intends to highlight the same. Current market offers wide range of mobiles with different screen sizes and resolutions, hardware capabilities, varied operating systems etc. In order to launch an efficient mobile app, it is must to perform strategic testing so that user can have wonderful experience with any sort of mobile device he holds. 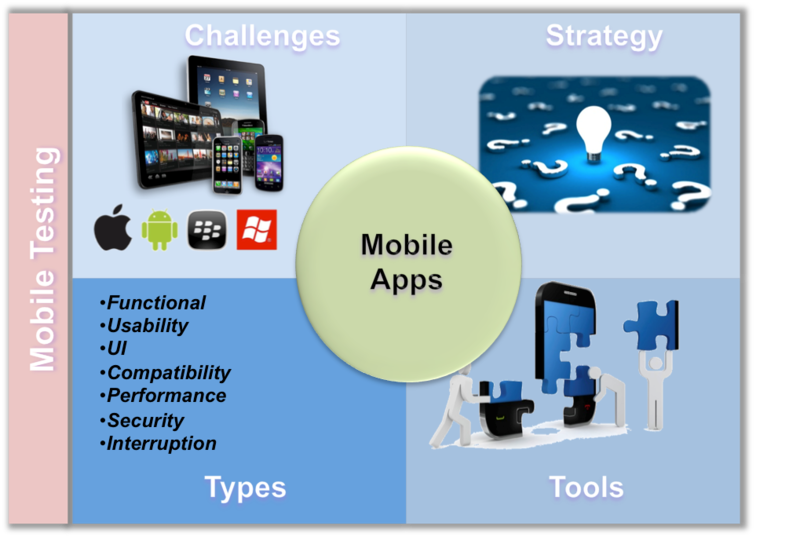 This blog will present best testing strategies and tactics for mobile applications. Each platform has laid out its UI design and navigation guidelines and mobile apps developed for the sespecific platforms much confirm to these guidelines to get successfully published. Testing of mobile applications needs special tools emulating the near actual device behavior. Test coverage with these tools can only reach 70%. Using actual devices for testing can provide actual results but using actual devices is costly, time consuming and impossible to cover all variations. Other important aspects are the app should utilize the device resource optimally like CPU, power etc. Poorly build apps can drain the phone battery and users are likely to uninstall these apps even if the app is functionally great. This type of testing mainly covers functional, business requirements and app workflow. The other aspects covered are error handling and error message to user, language and validations. Check all UI element alignments, font color, size, margins from screens. Check the UI design guidelines laid out by specific platforms are adhered. Check application compatibility with various screen form factors. This covers the ease with which the application can be used by user. The application should be checked for responsiveness, accuracy, screen navigation etc. Test the application for compatibility for various platforms, platform versions and devices as per the requirements. The application is also tested for browser compatibility, network compatibility and compatibility with other apps on the device. Check the app for memory, CPU and battery usage. Other aspects covered under this test are test for server connections, network switch over from WIFI to 2G/3G and vice versa, test for device resource like camera, GPS, etc. This testing covers the security aspects like, authentication, authorization, data protection, encryption/decryption of data while communicating with servers. Interruption testing is used to check app behavior during interruption from notification or other apps like, phone calls, messages, calendar events, camera, alarm, battery notification, other app notifications, voice messages. Mobile testing automations important to improve the testing Using above techniques to achieve maximum test coverage, it is extremely important for QA teams to automate the testing. Automation will also reduce time, cost and help achieve better quality. Automation can be achieved using various tools available in market and on cloud. We have seen the challenges in testing mobile application, it is important that right testing technique and strategy is used. The blog will touch upon few important techniques used for testing. Emulators are most commonly used for mobile testing, these are mostly available with all platforms and any app can be tested on these. These are cost effective solutions and can be used by testing teams to perform most of the testing. However test coverage using emulators is limited. Actual devices can be used for testing the apps, these provide the real testing environment and best functional and NFR coverage. However it is not practical to test the app in multiple devices due to cost involved. This is an emerging trend in software testing, which leverages the benefits of crowdsourcing and cloud platforms. To briefly touch upon crowdsourcing, the testing is carried out by different testers from different places unlike hired professions within an organization. 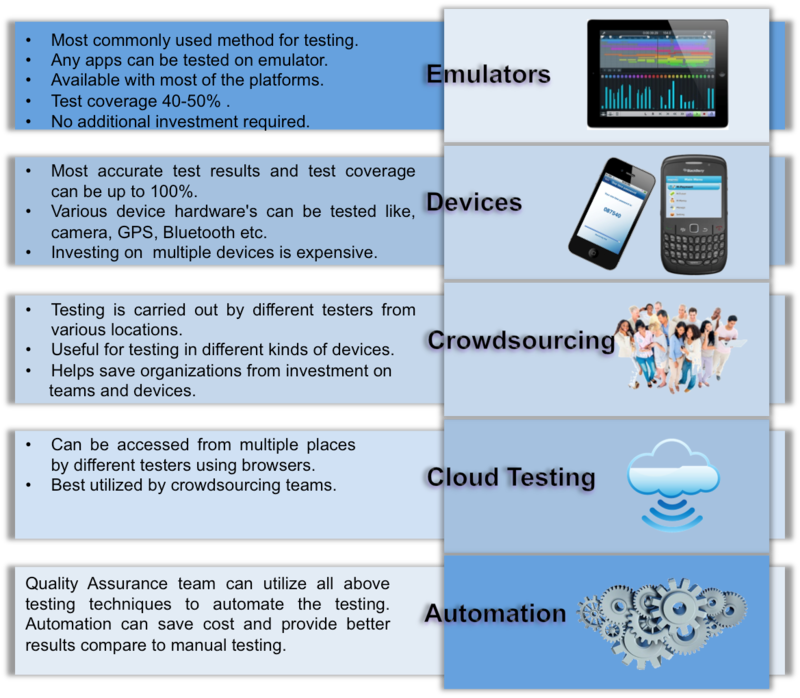 Crowdsource testing offers the large variety of choices for testing in various devices, platforms and form factors and various networks. This application can be deployed and tested on a cloud, it can be assessed by testers from various locations using web. Cloud testing is used helpful when using Crowdsource testing. Thank you for the informative post. It was thoroughly helpful to me. Keep posting more such articles on software testing course in Chennai and enlighten us. Testing is the only way to deliver reliable products in the Information Technology market. Articles like this are vital in improvising one's ability as a software testing professional. Thank you so much for sharing this information in here. Keep blogging. This blog is not just commenting blog it has to shared for everyone to get idea about the humming wave technologies.. Mobile Testing security and other concepts realted to testing has been explained very well. But still more concepts are left out in testing concepts i wish to follow your blog. Thanks for the info. Testing is most likely wanted one IT field.These blog about Software Testing isreally wonderful. Very much useful post on mobile secure browser pretty good one in order to have QTP Training in Chennai visit our best training institute in qtp domain. nice post about mobile apps.. Very good post. Keep rocking!! As everyone know, mobile application development is very important in nowadays. When you find the right mobile application development company, from there you can get huge unique apps at low cost. Loadrunner Training in Chennai | Angular Js Training in Chennai. Fantastic blog post! This is so informative.Thank you so much for giving such valuable information about Mobile app testing strategies. We are also giving the best android app development testing strategy. Quite Interesting post!!! Thanks for posting such a useful post. I wish to read your upcoming blog to enhance my skill set, keep blogging. Thanks for sharing this mobile app testing strategies, really helpful to me. you have brainstormed my mind with your excellent blog. Thanks for that !